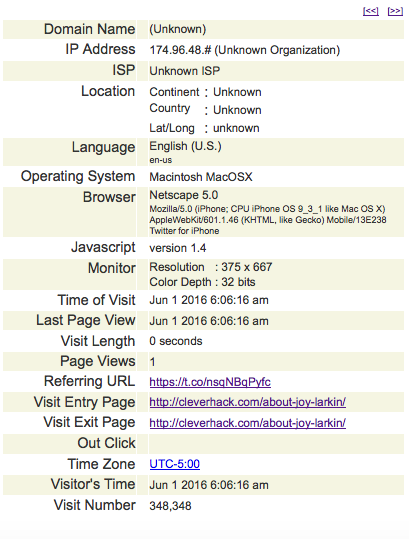 Earlier this week, I had a cleverhack visitor who clicked on the URL in my Twitter bio. Since they were using the Twitter for iPhone app, and the app does not open a mobile Web browser, a unique Twitter for iPhone user agent showed in the visitor logs. This entry was posted on Sunday, June 5th, 2016 at 11:36 am	and is filed under Tech, Internet, Web Marketing. You can follow any responses to this entry through the RSS 2.0 feed. You can skip to the end and leave a response. Pinging is currently not allowed.